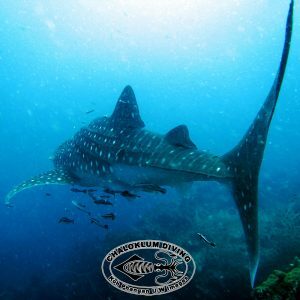 Koh Phangan information > Whale Sharks in the Gulf in May? Whale Sharks in the Gulf in May? Chaloklum Diving wish you summer greetings from a typically peaceful, post-full moon party island. What’s not so typical is the fact that a bunch of Whale Sharks seem to have taken a liking to Koh Phangan’s top dive destination Sail Rock, and we’ve been seeing them most times that we make a diving, and snorkelling, trip out there. As it is also low season, it means that we have been neglecting our other favourite destinations – Anthong Marine Park and Koh Tao are still very much off the schedule although we have had some nice SCUBA dives at our local, Koh Phangan dive sites. The diving school team (what’s left of them) are mainly taking it easy at the moment with few PADI courses going on, apart from Discover SCUBA Diving – although we do have a number of Open Water Diver courses and some continuing education planned for the end of the month. And a big welcome to Matt and Stephi – adding their social networking and marketing, as well as SCUBA diving, skills to the team – thanks to them Chaloklum Diving are already functional on Instagram (chaloklum_diving, until we get the widget…), which should be a better base for some of our underwater photography. Whale Shark at Marine Park !